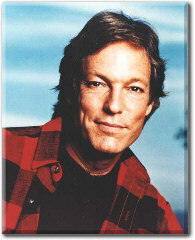 Richard Chamberlain has created a singular position with the world of mini-series, having starred in some of the most dramatic and powerful productions in the history of television. Over the last two decades Chamberlain has starred in six of the most acclaimed mini-series: "SHOGUN", "WALLENBERG", "THE THORNBIRDS", "THE BOURNE IDENTITY", "DREAM WEST", and "CENTENNIAL." For "SHOGUN", the ten-hour mini-series based on James Clavell’s towering best-seller, Chamberlain essayed the role of John Blackthorne and spent over six months in Japan filming the program. For the equally ambitious "THE THORNBIRDS", a mini-series based on the international best-selling novel by Colleen McCullough, Chamberlain starred as Father Ralph de Bricassart. This ten-hour mini-series was filmed in California and Hawaii. In 1985, Chamberlain portrayed the title role of Raoul Wallenberg, the Swedish diplomat who helped save one hundred thousand Jews during World War II. This four-hour production was filmed entirely on location in Yugoslavia. "SHOGUN", "THE THORNBIRDS’, and "WALLENBERG" are all epic dramas that speak a humanistic and universal language, translating into stories and characters with appeal to viewers worldwide. Indeed, the impact of these shows has established Chamberlain as an international star. "SHOGUN" earned Chamberlain a Golden Globe Award as Best Actor, as well as an Emmy nomination. He also received a Best Actor Award issued by London’s TV Times Magazine for his work as Blackthorne. The actor received another Golden Globe Award, Emmy nomination, a People’s Choice Award, and US Magazine ‘s 1983 Readers’ Poll Award as Best Actor in a Dramatic Series for his work in "THE THORNBIRDS." Chamberlain created another multi-dimensional character when he starred as Dr. Frederick Cook in the telefilm "COOK AND PEARY: THE RACE TO THE POLE", which he filmed in Canada with Rod Steiger who co-starred as Admiral Peary. One of Chamberlain’s most treasured roles was that of John C. Fremont in the 1986 CBS mini-series "DREAM WEST", based on the life of the California maverick. In 1987 he returned to Broadway to star opposite the late Geraldine Paige in Noel Coward’s "BLITHE SPIRIT." Prior to that, he spent a year in Zimbabwe filming "KING SOLOMON’S MINES" and the sequel "QUATERMAINE." Chamberlain was born in Los Angeles, and first wanted to become an artist but switched gears when he scored successfully in theatrical productions at Pomona College. Following college, he was drafted into the U.S. Army, where he gained his sergeant’s stripes in Korea. Returning to Los Angeles, Chamberlain made the move away from painting and furthered his acting ambitions by studying under Jeff Corey. He was also a founding member of Company of Angels, the excellent Los Angeles Theatre company. He was then featured in a dozen American television programs in guest roles until he landed the lead in the ill-fated series pilot "PARADISE KID." Then suddenly, in 1961, Richard Chamberlain’s luck changed when the title role of the TV series "DR. KILDARE" made him a household name, literally overnight. He played the popular physician for five years, and at the height of his fame was receiving over 12,000 fan letters a week, far more than even Clark Gable ever received. At the end of his reign as "Kildare" Chamberlain chose not to continue acting on television in any of the many series he was offered. Spurred on by the two feature films he made during his "Kildare" run –"JOY IN THE MORNING" opposite Yvette Mimieux and "TWIGHLIGHT OF HONOR" opposite Joey Heatherton-- Chamberlain chose to try his hand at the American stock repertory circuit in such plays as "PRIVATE LIVES", "THE PHILADELPHIA STORY", and "WEST SIDE STORY." His later feature performance as the brutal husband of Julie Christie in the Richard Lester film "PETULIA" was critically well received, but didn’t seem to further his career. A low point came when Chamberlain starred opposite Mary Tyler Moore in the Broadway bound musical "BREAKFAST AT TIFFANY’S" which closed prematurely after only four performances in New York. Early in 1968, he decided to try his luck in England with British repertory theatres and perhaps features and television. In London, director James Cellan Jones thought he might be right for the role of Ralph Touchet in the six-part BBC TV serial adaptation of Henry James’ "PORTRAIT OF A LADY." Surprised critics admitted their unstinting praise of Chamberlain’s performance, and for the young American actor it was the turning point of his career. He next portrayed the romantic Frenchman opposite Katherine Hepburn in Bryan Forbes’ film of Jean Anouihl’s "THE MADWOMAN OF CHAILLOT," and topped that by becoming the first American actor to play "HAMLET" in England since the great John Barrymore in 1929. Chamberlain had purposely chosen the Birmingham Repertory Theatre when he elected to tackle "HAMLET" because it was in the English provinces and comfortably distant from London’s demanding critics. The press, however, poured into Birmingham for his opening night and accorded him excellent personal notices. In a subsequent television production of Hamlet for Hallmark Hall of Fame Chamberlain repeated his original stage triumph, co-starring Sir John Gielgud, Michael Redgrave, and Margaret Leighton. Returning to films, Chamberlain was the cunning Octavius in "JULIUS CAESAR," shot on location in Spain in 1970. He then portrayed the tormented Russian composer, Peter Ilyich Tchaikovsky, opposite Glenda Jackson in Ken Russell’s "THE MUSIC LOVERS." Once again Chamberlain’s sensitive performance won him rave reviews in a difficult part. He followed this with Shakespeare’s "RICHARD II" during the 1971 season with the Seattle Repertory Theatre, for which he gained high praise from Time magazine. When the play reached the Eisenhower Theatre of the Kennedy Center for the Performing Arts, the Washington Post stated that the production "heralded the rise of Richard Chamberlain as a classical actor of penetration and range." Back in England, he played ‘Thomas Mendip’ in "THE LADY’S NOT FOR BURNING" at Chichester in 1972, and portrayed Lord Byron opposite Sarah Miles in the title role of Robert Bolt’s film "LADY CAROLINE LAMB." He returned to Hollywood to portray King Edward VIII with Faye Dunaway as Wallis Simpson, and then starred in the TV film "THE LAST OF THE BELLES," playing opposite Blythe Danner and Susan Sarandon. He next played William Holden’s villainous son in the box office blockbuster "THE TOWERING INFERNO." He followed this on location in Italy with another starring role in the classic Dumas remake of "THE COUNT OF MONTE CRISTO", for which he received an Emmy nomination. In 1978, Chamberlain directed Michael Cristopher’s "THE SHADOW BOX" at the prestigious Williamstown Theatre Festival, and later returned to act in George Bernard Shaw’s "ARMS AND THE MAN." He returned to motion pictures again for director Richard Lester in the swashbuckling extravaganza based on Dumas’ classic "THE THREE MUSKETEERS." Chamberlain portrayed the elegant, womanizing, priestly musketeer Aramis. He played the same flamboyant character in the films’ two sequels, "THE FOUR MUSKETEERS" and "THE RETURN OF THE THREE MUSKETEERS", which reunited him with Michael York and Oliver Reed. Following the "MUSKETEERS" movies, Chamberlain starred to critical acclaim in Edmond Rostand’s "CYRANO DE BERGERAC", for which he received the Los Angeles Theatre Critic’s Award. He followed this with "THE LADY’S NOT FOR BURNING" for American Public Television with Eileen Atkins. Chamberlain continued to demonstrate his wide ranging versatility with such contrasting roles as Prince Charming in the musical film "THE SLIPPER AND THE ROSE", as well as Reverend Shannon in the Los Angeles and Broadway productions of Tennessee Williams’ "THE NIGHT OF THE IGUANA." He also starred in yet another acclaimed remake for television, the title role of the classic, "THE MAN IN THE IRON MASK." In 1979, Chamberlain was seen on television as well as on movie screens. The epic mini-series "CENTENNIAL" starred Chamberlain; in films he appeared in Irwin ALLEN’S "THE SWARM", followed by raves for his performance in Peter Weir’s fascinating Australian feature "THE LAST WAVE." He also played ‘Bobby’ in "COMPANY" on the PBS special, "MUSICAL COMEDY TONIGHT." In 1981, he starred in the New York premier of Joseph Papp’s production of Thomas Babe’s "FATHER’S AND SONS", playing Wild Bill Hickock. He then recreated his acclaimed performance in Los Angeles. Chamberlain recently starred as Henry Higgins in the 1993-94 Broadway smash hit "MY FAIR LADY," which also toured throughout the U.S. He reprised this role in an all new production for Europe during the 1995-96 season, playing in major cities including Paris, Berlin, Munich, Zurich, Hamburg. His latest European film, "BIRD OF PREY", was shot entirely on location in Bulgaria. After Bulgaria, he completed the sequel to acclaimed production "THE THORNBIRDS" called "THE THORNBIRDS: THE MISSING YEARS." During the summer of 1996 he filmed a four-hour mini-series called "THE LOST DAUGHTER", a Canadian-Swiss-German co-production. He also filmed a feature film entitled "RIVER MADE TO DROWN IN" in the fall of 1996. A television special called "ALL THE WINTERS THAT HAVE BEEN" based on a book with the same title by Evan Maxwell was opened the fall season for CBS in September of 1997. Chamberlain starred on Broadway in THE SOUND OF MUSIC which also toured the US. His most recent acting work has been on the HUSTLE series from BBC, and guest roles on WILL & GRACE and DESPERATE HOUSEWIVES and the very successful Adam Sandler film I NOW PRONOUNCE YOU CHUCK AND LARRY. Aside from acting, Chamberlain has long been known for his interest in environmental affairs. He lobbied long and hard in Sacramento, California, as well as, Washington D.C. to save the Tuolommne River flowing from Yosemite National Park in California. His efforts helped to win a "Wild and Scenic" designation for the river. He also narrated a widely acclaimed Audubon television special about the poaching of animals in National forests. One of his special projects was an Audubon special about Hawaii’s precious ecology. In 1989 he was the principal speaker at the San Francisco Ecological Convention. Richard also narrated cinematographer Don Briggs’ film "The Grand Canyon, It’s History, and Fragile Ecology." Chamberlain has returned to painting and show his work at the Celebrity Gallery in Wailea, Maui. Chamberlain is a resident of the Hawaiian Islands.